Breathtaking is the word. Thundering is also apt from the aural perspective. The sight and sound of so much water falling down from such a height is majestic. There is a permanent mist around the falls. When the wind blows towards the shore, the mist falls down as small showers on the shore. Apparently 202,000 cubic feet of water tumble down the falls every second (5,720 m³/s); forget the numbers, that's a helluva lot of water. At this rate, the total water consumed in all our houses Bangalore in a day flows over the falls every 3 hours. The volume of water flowing is seasonal, of course. During winter sometimes a thin sheet of ice forms on the river adding to the beauty. Look at the satelite map from Google Maps below and also the aerial picture from Wikipedia. Niagara falls is around 120 kilometers from Ontario and around 200 kilometers from the place I am staying. It is right at the border of US and Canada on Niagara river. Apart from being a wonder of nature, it is also an important source of hydroelectric power. There are two falls in Niagara - the Horseshoe falls on the Canadian side and the American falls on the... well... American side. The Horseshoe falls are bigger and wider than the American falls. 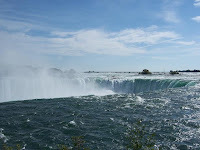 Lucky us, we were on the Canadian side this time and could go near the bigger Horseshoe falls. 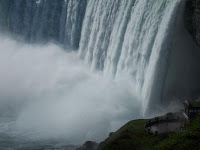 There are two attractions at the falls that you must not miss - travel by the "Maid of the Mist" boat till the edge of the falls, and a view of the falls from a tunnel dug at the bottom of the Horseshoe falls - "Journey Behind the Falls". Maid of the mist was good, the boat must be really powerful to be able to take us against the force of water. We had gone on Maid of the Mist VI, which has been in service since 1990. Unfortunately there was not enough time for us to go for the journey behind the falls. 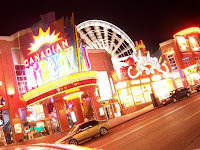 The night life around Niagara is quaint. A few shops, casinos, bars and pubs.